Celebrating the best of Bengaluru, 93.5 Red FM, through its unique Red FM ka Thappa campaign, invited votes from all across the city for Bengalureans to vote for their favourite local iconic spots. The people of Bengaluru voted in plenty across categories like – Coffee, Biryani, Buffet, Malls and Ice Cream to pick their favourite outlets. In cities like Mangaluru, Mysuru and Gulburga, Red FM ka Thappa is christened Red FM Na Chaapu. 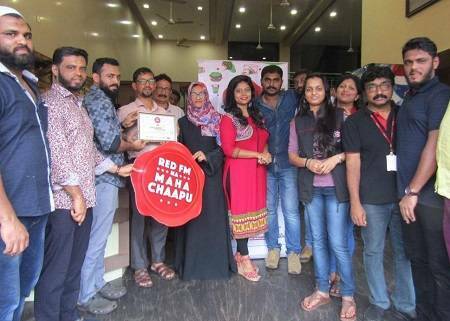 This year, Bombay Lucky Restaurant reigned supreme by bagging the Red FM ka Maha Chaapu stamp of approval for serving the best biryani in all of Karnataka. Apart from the winner Bombay Lucky Restaurant (Mangaluru), nominees included eateries like Nandhana Palace (Bengaluru), Donne Biriyani Mane (Mysore), and Galaxy Restaurant (Gulbarga). Red FM’s campaign Thappa is a people’s choice award, where listeners across cities vote for their favourite places and services. The most voted in the city is honoured with Red FM’s approval stamp ‘Thappa’. The Thappa campaign is a three-week long annual IP that brings a lot of excitement across 30 major cities pan-India, including major cities like Lucknow, Jaipur, Chandigarh, Indore, Pune, Ahmedabad, Guwahati, and Bhubaneshwar. Listeners also get a chance to win the biggest fan contest by voting.